The sequel to one of the best communication testing video games brings back everything you loved with some meaningful additions. Overcooked 2 includes new stages and different recipes to keep things interesting but the ability to throw ingredients is extremely welcomed. The silly, light-hearted themes present throughout are excellent and with the option for online multiplayer this follow up easily surpasses the first game. While there aren’t any major changes to the formula, the game still provides a great deal of fun. Once again the kingdom is in peril and it’s up to the Onion King’s personal chefs to go out and satiate this new threat’s appetite. The writing continues to be silly and the food based puns are enjoyable. The number of playable chefs have increased with fan favorites making a return. I personally enjoyed the new squid and gold-toothed miner characters myself. Other additions include new recipes such as sushi and cakes and the new throwing ability is greatly utilized. Any raw or chopped ingredient can be tossed around the stage to help speed up a number of tasks. You can throw food from one chef to another, you can also toss items into the pots/pans to start cooking. There are a number of stages that are smartly laid out to really motivate you to throw your food around. These are minor upgrades but they make a big difference coming off the first game. New stages and the different obstacles they bring are also present. 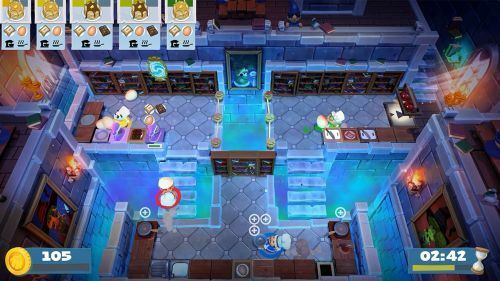 One of the major updates to Overcooked 2 is that one or two stages per world will transform mid game. You may start out on a hot air balloon but the thunderous storm that brews will quickly knock you out of the sky into a seafood restaurant. These stages add a great deal of chaos to your cooperation and help keep things interesting. Throughout the world map there are secret “Kevin” stages (named after the Onion King’s thick eyebrowed dog for no discernible reason). The game tells you that unlocking these will require completing specific objectives in certain stages. Unfortunately you are never told what these are or which stages require the extra work. I was able to unlock most of them just by playing well as I went along but some really had me scratching my head. The idea of having to do a unique task or something silly to get a secret stage is great but, after looking online for answers, it turned out they are all unlocked by simply getting a high enough score/combo. While many games will have primary and secondary objectives to add replayability for the player to tackle, Overcooked 2 hides this info away for no useful reason. The game does flash a white dot on the stage requiring the bonus points but that isn’t mentioned in game either. It’s a shame that I had to look elsewhere for this useful information and once finding my answers they ended up being lackluster and not exciting. Overcooked has always been about how well can you and your friends work together while obstacles form left and right. You can play through the story in single player, switching between two chefs, but this game shines in multiplayer. It was disappointing when the first game only allowed local coop and it is an absolute treat that the developer has rectified that for the sequel. Being able to play online with your friends makes this game an instant buy for any fans of the first. It could almost be argued that adding online multiplayer to the first game would be enough of a bonus for an additional purchase. For players playing with random people you do have the option of sending out helpful emotes. These can be anything from silly gestures to information about what task you’re going to tackle next. It does a good enough job for those without a headset on but these players will be missing out on the joyful insanity that comes from yelling at one another. Being able to play this game in a multiplayer setting regardless of where your friends are is extremely welcomed. The biggest issue that the first game had was a severe late game difficulty increase and it’s nice to see that that is completely absent in the sequel. In order to get through much of the last world or two in the first Overcooked, you needed to be achieving a perfect score on all the previous levels. If you didn’t get three stars (out of a total of three stars) on every stage before, you weren’t going to have enough to unlock these late game areas. 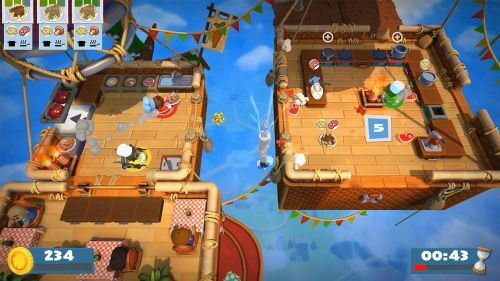 In Overcooked 2 stars come quick and fast the whole way through. In fact, scoring high is easier than ever with the addition of a combo system. Serving meals in the order they arrived (without taking too long) will add a bonus to your tips that greatly increase your score. This not only helps boost your star count but it adds another layer to what you should be communicating and when. The combo system is a worthwhile addition and helps you never hit a wall in progressing. 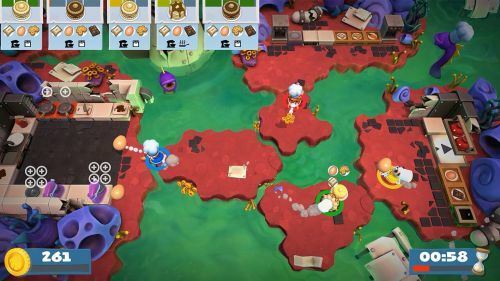 Overcooked 2 adds online multiplayer and that alone should be enough to sell you on this game. Being able to play with your friends anywhere makes this fantastic party game that much more appealing. The new chefs, transforming stages, and new recipes all do a good job of making this sequel feel fresh while the throwing food ability really amps up the options for how to work together. It’s a bummer that the secret stages were implemented poorly since bonus objectives are always fun to try and meet. In the end, Overcooked 2 surpasses the first as a must play multiplayer game.